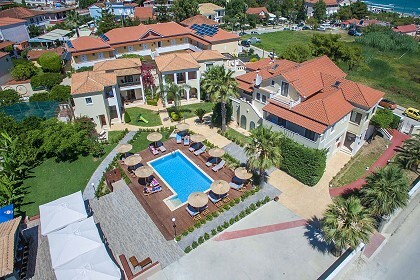 Christy's Beach Villas are located a 2 minute walk from the beach of Tsilivi in private landscaped grounds with spacious gardens of lush greenery, pine trees and fruit orchards. The villas although central and close to all amenities, shops, restaurants and bars, are also set in a unique quiet scenic area and are ideal for families and couples to enjoy relaxing holidays. The warm friendly owners of Christy's Villas are waiting to welcome all of its guests a traditional Zakynthian welcome and assist and offer advice on anything they may require during their stay. Christy's villas have been constructed following Mediterranean architectural style using natural building materials and consist of four neoclassic two - storey maisonettes and two luxurious apartments, with a magnificent view to the sea, stretching out as far as the eye can see and a private garden each. 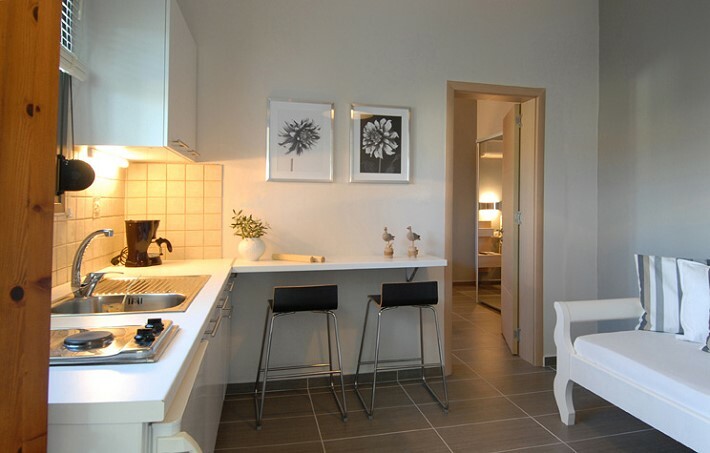 All villas are exquisitely decorated with warm colours which blend together with attention to detail giving a sense of calm and a welcoming atmosphere. 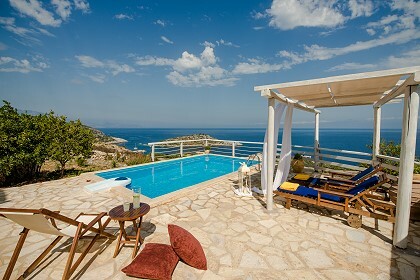 Villas provide luxurious bedrooms with double beds, living room, fully equipped kitchens with all utensils and cooking facilities necessary for making meals, luxurious private bathrooms and spacious veranda offers splendid views onto the blue sea. Christy's Beach villas offer a wide range of luxury facilities and features to make their guests stay an enjoyable and memorable one including Air-conditioning, satellite TV, mini stereo/CD player, external line telephone, wireless internet, safety deposit boxes, iron, hairdryer, fully equipped kitchens, private parking, daily maid service and private spacious verandas with sea views. Christy's village are located in the resort of Tsilivi on the North east coast of Zakynthos, 9km from the airport and 5km from the capital of the island Zakynthos Town. The resort is set amongst olive groves and vineyards and its special features include a fantastic golden sandy beach of around 2km long that is well worthy of its Blue Flag of Cleanliness reward. The sand shelves gently into the sea making it the ideal place for children to enjoy themselves in complete safety. There are numerous tavernas serving traditional Zakynthian cuisine, restaurants, bars and many local shops to explore. The friendly fun atmosphere combined with the natural beauty of Greece and the guaranteed weather makes this resort an ideal setting for people of all ages, a perfect holiday!